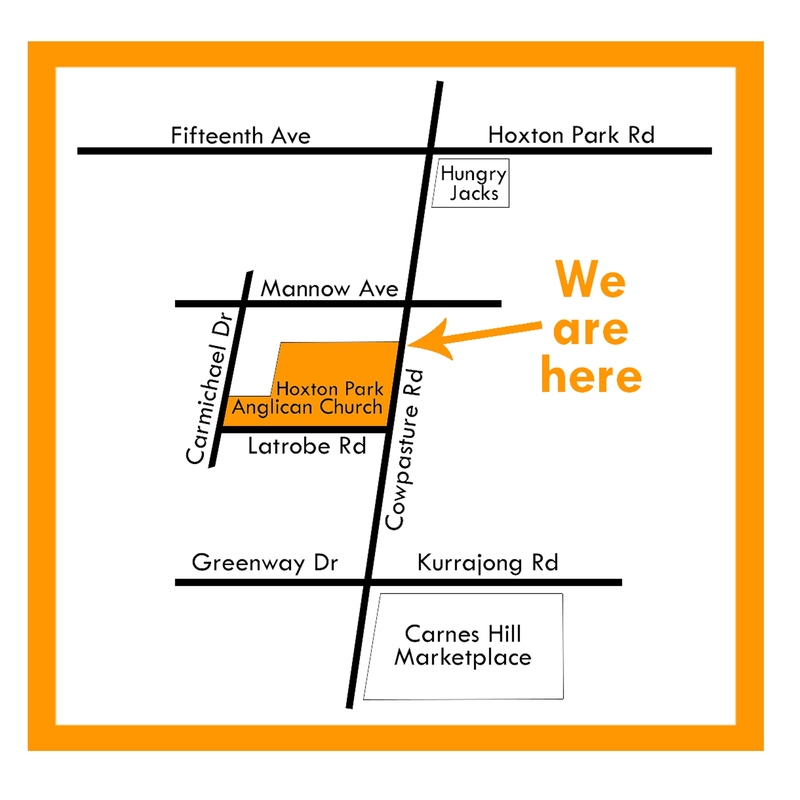 We are located on the corner of Cowpasture Rd and Latrobe Rd, West Hoxton. If you are coming from the north, take Cowpasture Rd until Mannow Ave (the first right turn after Hungry Jack’s). Turn right at the traffic lights into Mannow Ave, then left at the roundabout into Carmichael Dr, then left again at the next roundabout into Latrobe Rd. The entrance to the church car park is on your left. If you are coming from the south, take Cowpasture Rd until Latrobe Rd (the first left turn after Carnes Hill Marketplace). Turn left into Latrobe Rd – the church is on your right, but you will need to continue to the top of Latrobe Rd and do a u-turn at the roundabout. The entrance to the church car park will then be on your left. Bus routes 853, 854 and 855 all service the bus stop out the front of the church, on Cowpasture Rd. Route 853 runs between Liverpool Station and Carnes Hill, through Middleton Grange and along Hoxton Park Rd. Route 854 runs between Liverpool Station and Carnes Hill (Greenway Park), through Hoxton Park and along Hoxton Park Rd. Route 855 runs between Liverpool Station and Leppington Station, through Casula and Prestons. For timetables, route maps and to plan your trip, visit interlinebus.com.au. For a printable map of the area, please click here.